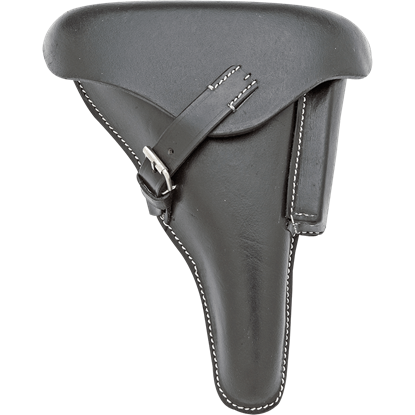 We have pistol holster, Civil War holsters, Western gun belts and gun holsters are made from top quality leather. 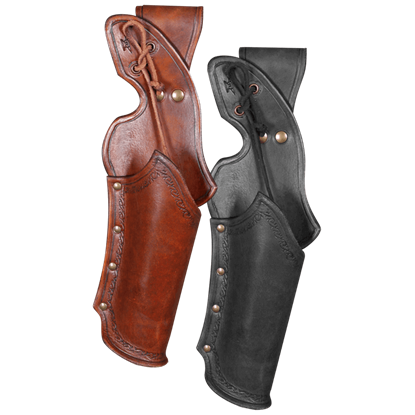 Our Western gun holsters are great for re-enactments, stage props, roleplaying, and cowboy shootouts. 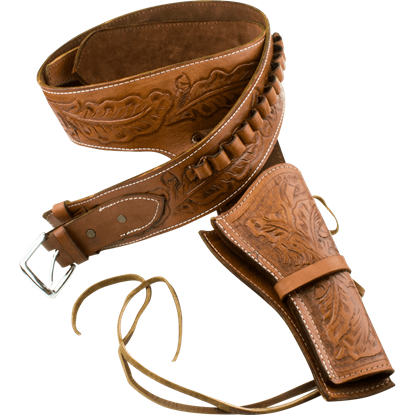 The western gun belts come in a variety of sizes and styles. We have left draw holster, right draw holsters, and double holster. 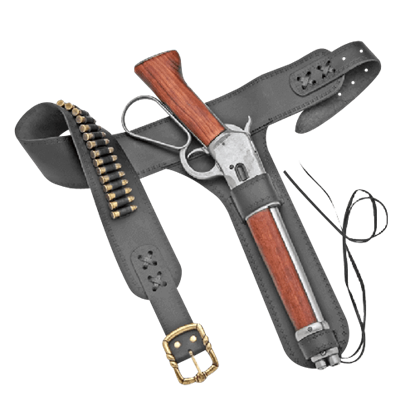 Some of our gun belts are equipped with shell loops to accommodate the replica shells or bullets and the holsters have leg-ties to fasten them securely to your leg. We also carry a wide variety of Civil War holsters that are available in brown or black leather. We have Confederate holsters and Union holsters that have, "CS" and "US" imprinted on them. These military holsters are great for Civil War re-enactments or stage play. These pistol holsters are not just props though, you may use the with your own real firearms. A distinctive weapon like a shortened rifle needs the right holster. 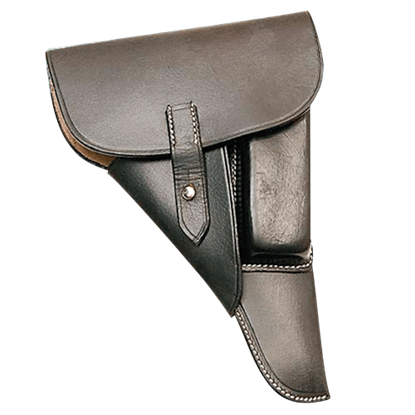 The 1892 Shortened Lever Action Rifle Leg Holster is designed for a shortened rifle and pairs well with the 1892 Shortened Lever Action Rifle (AC-22-1095). 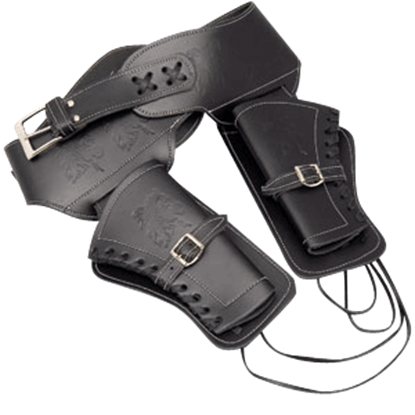 These Western-style tooled holsters and belts are made from genuine leather. The belts are equipped with shell loops to accommodate replica shells. This model has a double draw holster and is sized for a large waist. 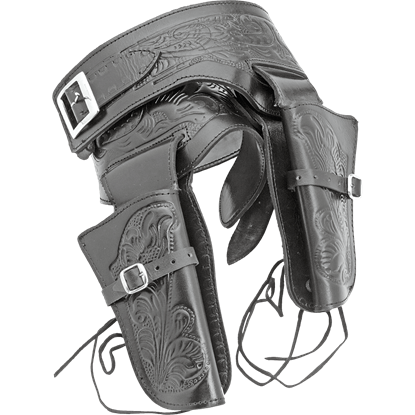 These Western-style tooled holsters and belts are made from genuine leather. The belts are equipped with shell loops to accommodate replica shells. This model has a double draw holster and is sized for a medium waist. 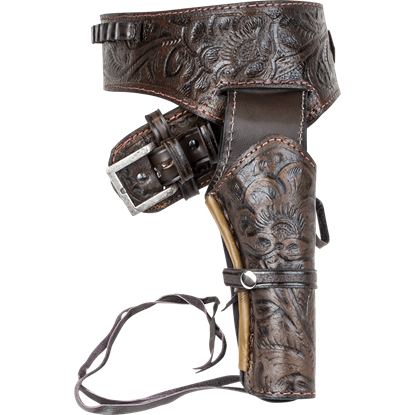 These Western-style tooled holsters and belts are made from genuine leather. The belts are equipped with shell loops to accommodate replica shells. This model has a double draw holster and is sized for a small waist. When cowboys are in a draw, they need to pull their pistol out of a holster that is equally as intimidating as their weapon. Made from smooth genuine leather, the Black Leather M1873 Revolver Holster will achieve that look for you. No revolver is complete without a holster, and they do not come any better than the Deluxe Antiqued Brown Leather Holster. 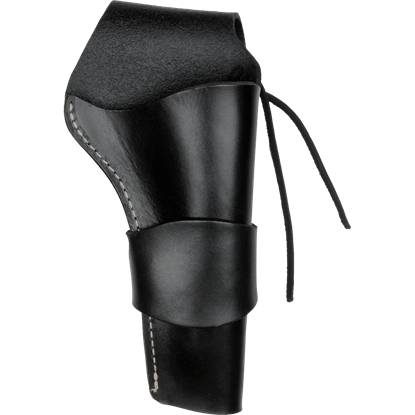 Made from real leather, this holster is an exquisite addition to your collection of firearm accessories. When thinking of the traditional cowboy style, a tan leather holster always comes to mind. If the same is true for you, then make sure to add the exquisitely crafted Deluxe Antiqued Tan Leather Holster to your collection or wardrobe. Retell the story of a gun-slinging outlaw or rescue a passenger-filled train from bandits during an adventure on the American frontier. The Double Tooled Black Leather Western Holster keeps your trusted peacemakers at the ready. The pistol clicks, taking aim at the dashing image in the mirror. The antique look and feel of the reenactment piece adds flair to your costume. The Dragone Leather Holster safely secures the treasured find to your side. Danger can be just around the bend in a steampunk setting, which is why you should never go anywhere without your weapon of choice. 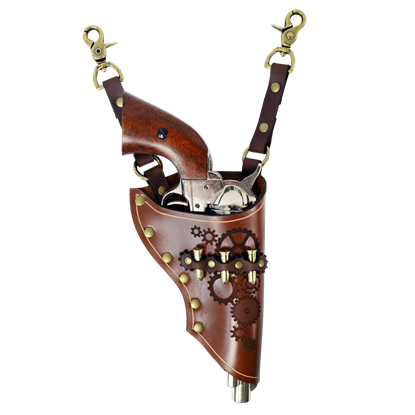 And if that weapon is a pistol, you can carry it in style with this Geared Steampunk Pistol Holster. The Luger P08 pistol was first issued to German forces in 1904 and saw use in both World Wars. This German P08 Military Pistol Holster is modeled after the holster that would have held these legendary pistols. This holster is so realistic and like the original that it would take an expert to tell them apart! The German SS Soft Shell P.38 Holster is a historic replica that pairs perfectly with a Walter P.38 Automatic Pistol replica. Thank you both so much for following up as diligently as you have. You guys are great and I hope your supervisors know that! !